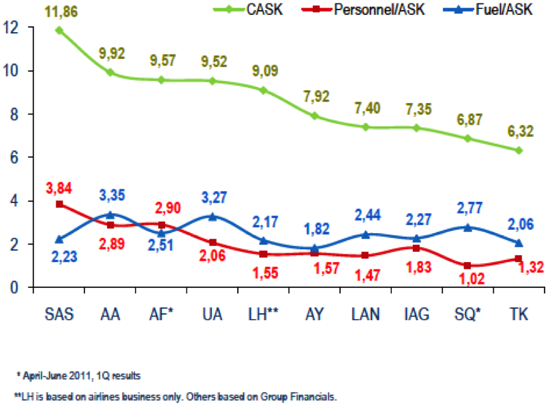 Turkish Airlines (THY) in 1H2011 had one of its worst half-year performances in the past decade. The airline sunk deeply into the red in the six months to 30-Jun-2011. THY, one of Europe’s largest and fastest growing carriers, was hit by by a weakening local currency increasing foreign exchange losses, particularly on its majority-leased fleet, as well as the soaring price of fuel in 1H2011. The Star Alliance member reported an unexpectedly heavy net loss of TRY543.6 million (EUR248 million) in the first six months, as spiralling fuel costs and massive foreign exchange losses from financial leases neutralised revenue gains. The airline reported an operating loss of EUR135 million in the period, a sharp turnaround from 1H2010’s EUR60 million operating profit. Its EBIT margin of -6.1% compares poorly to the airline’s five-year average (2005-2010) of 7.3%. CEO Temel Kotil remains upbeat and has maintained THY’s guidance for a full-year profit - indicating the airline is banking on a very strong second-half. THY’s top line revenue surged 20% in the first half to EUR2.2 billion, outpacing the 10.3% increase in passenger numbers in the period to 14.8 million, with the passenger growth primarily in international expansion. 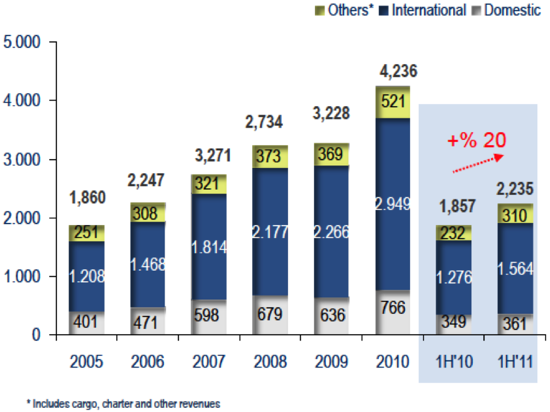 Strong revenue growth was recorded in the international and “other” units, including cargo, charter and miscellaneous revenues. International revenue increased 23% to EUR1.5 billion, on the back of aggressive international network expansion, and 'other' revenue increased 33% to EUR310 million. The domestic business reported more muted growth of 4%, to EUR361 million. 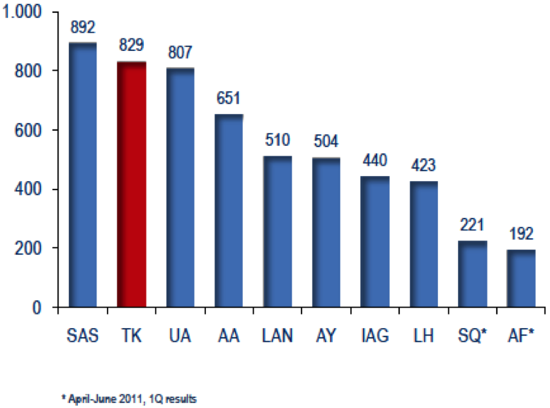 Passenger traffic accounts for 87% of THY’s total revenue, down from 88% in 1H2010. While this is a small change, it is a direct result of THY’s effort to diversify revenue streams with its expansion into the cargo segment, including by acquiring freighter aircraft. Cargo contributed 9% of first half revenue, up from 8% a year ago. Charter revenue contribute 1% and “other” revenue contributed 4%. On a regional basis, THY still generates the majority of its revenue in short-haul markets, although longer-haul markets are playing an increasingly important role. 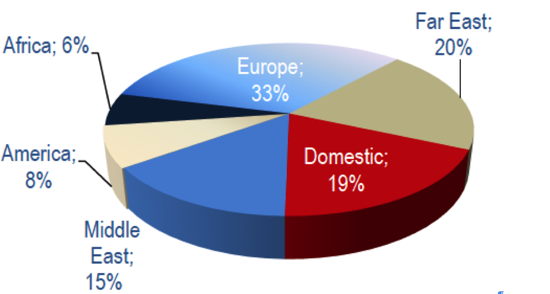 One third of passenger revenue is generated in Europe and a further 19% in the domestic market. Both figures are down 2 ppts from 1H2010. THY generated 20% of its revenue in the Far East, 15% in the Middle East and 8% in the Americas, all of which increased 2 ppts in the period. Africa’s revenue share remained flat at 6% as political uprisings across the region slowed capacity growth. 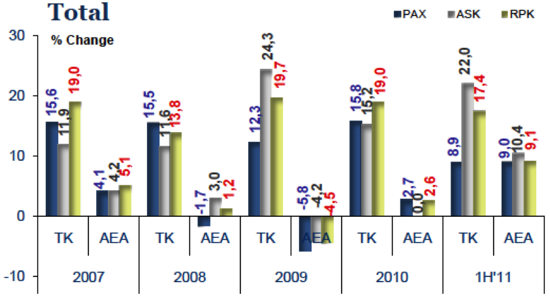 While THY does not report exact RASK figures, the airline noted a deterioration in its RASK performance. RASK fell 4% in the first half, with domestic RASK flat and (short-haul) international RASK down 4%, reflecting more long-haul flying. The result is a sharp turnaround from the impressive RASK growth of 13% in 1H2010, although that result reflected 1H2009’s awful pricing environment. 1H2011’s weak RASK performance also reflects THY’s large capacity (ASK) increase in the period, which caused a sharp fall in load factors across the network and hurt pricing. Overly aggressive capacity growth, in a bid to establish itself in key markets, came at the expense of profitability in the first half. This sharply weaker RASK performance, which contrasts with the vast majority of THY’s European peers, coincided with a marked increase in unit costs (CASK), squeezing the airline at both ends. Passenger traffic increased 8.9% in the first half to 14.8 million. Domestic passengers increased 5% to 6.7 million and international passengers surged 15% to 8.0 million. The overall increase represents a marked slowdown in growth for THY, which had increased passenger numbers by 19% in 1H2010, 10% in 1H2009 and 16% in 2008 – but 1H2011 compared to 1H2010 could repeat the pattern from 1H2008 to 1H2009 of slowing growth after economic downturn. THY’s passenger traffic expansion matched the first-half average growth of the Association of European Airlines (AEA), a benchmark against which THY has constantly compared itself. It is a benchmark THY had consistently outperformed and saw the airline widely regarded as Europe’s fastest growing major. 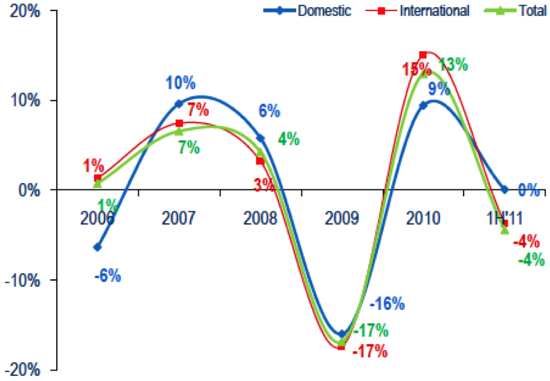 THY’s growth in key emerging markets remains well ahead of its AEA peers. While its European passenger numbers were below the AEA benchmark, its performance on routes to the Middle East and more significantly, the Far East, were well ahead of the AEA average. 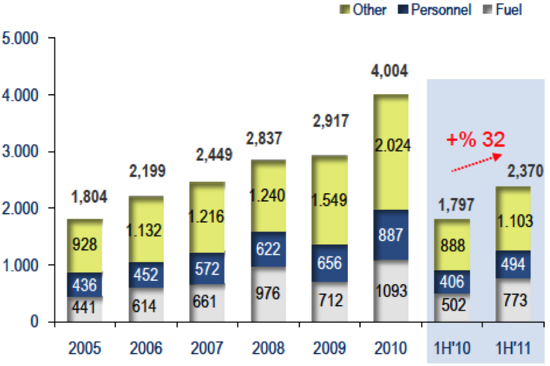 Middle East passenger numbers increased 11.7% and Far East numbers surged 25.6%. Far East ASKs increased a staggering 42.4% in the first half but were met by only a 27.1% increase in RPKs. Such aggressive capacity deployment - and resulting reduction in load factors - is likely to have hurt THY’s yield from the Far East region, but its ambitious drive is part of the strategy to gain a foothold in this key emerging region. Owing to its aggressive expansion into international markets, THY is still significantly ahead of its European peers in terms of total ASK and RPK growth. ASKs increased 23.6% in the first half, with RPKs up 19.0%. Load factors fell 2.7 ppts to 69.5%. In the domestic market, ASKs increased 5.3% and RPKs increased 4.0%, which saw loads fall 1.2 ppts to 74.8%. In the international market, which more closely captures THY’s vast expansion plans, ASKs increased 32.2%, RPKs increased 22.1%, pushing loads down 2.8 ppts to 68.6%. Operating expenses soared 32% to EUR2.37 billion in the first half led by fuel, which increased 54% to EUR773 million. Fuel accounted for 33% of total costs, up from 28% in 1H2010. Personnel expenses, THY’s second highest cost item, increased 22% to EUR494 million. Other significant percentage cost increases included ground handling (+41%), maintenance (+38%) and a major non-cash item, depreciation (+38%). Turkish Airlines has embarked upon a comprehensive, global advertising campaign in the past year, which includes high-profile sporting sponsorships and the use of prominent public figures to spearhead the effort. Advertising spend increased 67% year-on-year in the first half. But the major cost blowout for THY in the first half was its financial expenses. THY incurred a massive EUR267.9 million in financial expenses for the first half, compared with 1H2010’s EUR35.3 million. The sharp change was driven chiefly by foreign exchange losses as a result of higher aircraft leasing costs. Turkish’s fleet of 174 aircraft is 88% leased, according to THY. Fifty-one percent of aircraft are on financial lease and 31% on operating lease. Only 12% of aircraft are owned. The Turkish lira has depreciated sharply against both the US dollar and euro this year. Forty-three percent of THY’s expenses are in dollars, and 11% in euros. In the second quarter alone, the lira fell 5% against the dollar and 7.6% against the euro. The weaker lira makes US-dollar denominated expenses, most notably fuel and aircraft leases, more expensive. CASK increased in the first half to EUR6.32 cents, a 3% year-on-year increase. This only slight CASK increase, a creditable performance in light of significant cost rises, reflects THY’s rapid expansion of flying operations in the period. 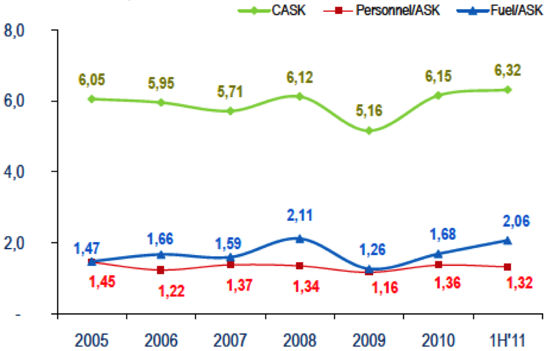 Fuel cost per ASK increased 22.6% to EUR2.06 cents (compared to FY2010) and personnel cost per ASK fell 3% to EUR1.32 cents (compared to FY2010), despite a 12% increase in headcount to 17,840. As previously noted, ex-fuel CASK was flat at EUR4.26. THY remains a highly efficient operation. Benchmarking itself against its full-service global peers, THY claims its ratio of passengers to personnel is among the highest at 829:1. THY also has a significant cost advantage over that same group of full-service airlines. In some cases, it enjoys a near 50% CASK advantage of rivals. While fuel costs, which reflect global rather than local conditions, are approximately the same (although THY claims an advantage here), THY enjoys a personnel cost advantage over many others. Utilisation rates fell in the first half, with widebody utilisation down 2.4% year-on-year to 12.5 hours and narrowbody utilisation down 6.4% to 11.1 hours. THY stated it aims to reduce costs with fleet expansion as greater scale economies accrue to the airline. New aircraft will lower the average age of the fleet and result in fuel cost savings, the airline says. As a result of its “young fleet and fuel-saving programme”, which it launched in Apr-2008, THY claims to have saved 6,495 tonnes of fuel and reduced carbon emissions by 20.5 tonnes. The airline did not indicate its level of currency hedging in place to lower its exposure to currency fluctuations. THY’s cash balance fell to EUR319.2 million at 30-Jun-2011, compared with EUR369.4 million at the start of the year. Cash flow from operations fell in the period, and debt increased. THY’s growth story, like its Gulf rivals to the south, remains compelling. It controls a dominant share of a key emerging market, accounting for 53% of both Turkey’s international and domestic markets in terms of passengers carried. It is rapidly expanding into other major emerging markets, most notably the Asia Pacific region, to tap into the growing demand for air travel and connections between Europe/Africa and the Asian region. The airline will ramp up services across its network in the second half, most significantly to North America, Africa and the Asia Pacific. THY now operates to 141 international and 44 domestic destinations. But in 1H2011, this drive for passenger and market share growth came at the expense of yield and profitability, both falling sharply in the period. A sharp rise in costs squeezed the airline, which resulted in heavy losses for the period. With such an aggressive growth trajectory, as the airline grabs market share from European majors, it is likely yield weakness could continue into the second half. This problem will become particularly acute if global economic conditions, upon which THY’s international segment heavily relies, deteriorate further. Global jitters also hurt risk appetite, further weakening the Turkish lira, which has been the cause of much of THY’s problems in 1H2011. THY is likely to receive respite in the seasonally stronger third quarter and the recent fall in oil prices. However, given the cloudy outlook for the global economy, the weak lira is likely to continue to pose a threat to earnings despite the carrier maintaining its guidance for a full-year profit. CEO Temel Kotil remains upbeat and has maintained THY’s guidance for a full-year profit - indicating the airline is banking on a very strong second half indeed.